HCX is a customer-focused hair salon. HairColorXperts is Charlotte’s leading salon for hair color, haircuts, and hair care. With advanced education and expertise in a range of hair services, our stylists are passionate about making YOU look and feel beautiful. Great hair starts with a personalized consultation. At HairColorXperts, you and your stylist will discuss the desired look and style you want as well as any concerns you may have about your hair. A trained stylist will analyze your hair and give a professional recommendation on what best suits you. HairColorXperts’ number one concern is that all of their customers are completely happy with the services they choose and the results. Your salon experience is our top priority. 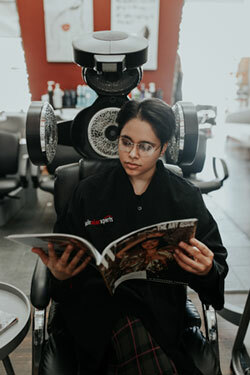 At HairColorXperts, our goal is to provide the best client services in a comfortable, inviting setting. Our talented team of professionals are dedicated to tailoring services to your unique hair-care needs & style. From classic looks to the most recent trends, we are here for you. We truly are the hair color experts. Come experience the difference an Xpert can make! This is what just a few of our customers had to say! This is a wonderful salon! Everyone is very well trained and very skilled in their craft. I am a former hairdresser and very picky!! This salon is very professional and friendly! I can’t say enough great things about them! You will have a great experience!! I am in the service industry and I deal with people on a day to day basis. Every time I come in to Hair Color Xperts I am treated with the upmost personal service from the time I arrive till the time I leave. The owner has assembled a talented competent happy team dedicated to 110% customer satisfaction.